Foresight is one of the most critical skills of a leader. Foresight is the capacity to accurately focus on the key factors of a rapidly changing and chaotic situation without losing sight of the big picture. The best leaders anticipate and develop an ability to see beyond the immediate and are able to visualize and plan several moves ahead of their opponent. Foresight helps leaders act in a manner that addresses problems in the short term and solves them in the long run. In war, foresight is as valuable as it is rare. In December 1940, Adolf Hitler was considered by many to be a leader with exceptional foresight. In 1938, he had bluffed the Allies at Munich and annexed portions of Czechoslovakia and eventually took the entire country without a fight. In 1939, Hitler’s forces attacked Poland while the French and British, who had pledged to fight if Poland was attacked, did little to help. The Poles fought and died alone and Hitler won another victory for the Reich. In 1940, Hitler unleashed a lightening war against Norway, Denmark, Holland, Belgium, Luxembourg and France. All these countries surrendered to Hitler’s armies. In 1941 Hitler’s legions seized Yugoslavia, Greece and Crete. In Africa, Rommel’s Deutsches Afrikakorps, was nearing the Suez Canal. By late 1941, Hitler’s empire stretched from the shores of France to the Parthenon in Greece and from the sands of Libya to the gates of Moscow. On December 7, 1941, Nazi Germany’s ally, the Empire of Japan, executed a surprise attack on the United States at Pearl Harbor, Oahu, Hawaii. The Japanese attack badly damaged the US Pacific Naval Fleet, sinking, among others, four battleships. American naval and aircraft losses were heavy. All eight American battleships anchored at Pearl Harbor, the pride of the US Navy, were damaged, with four being sunk, along with the loss of three cruisers and three destroyers. Although the US Navy’s aircraft carriers escaped the attack, 188 Army and Navy aircraft were destroyed. Most tragically, 2,403 Americans were killed, with another 1,178 wounded. That same day, the Japanese attacked US forces in the Philippines, and Guam, while simultaneously attacking British and Dutch forces across the Pacific. Those were brave words, but in 1941, the United States was not ready for war. The US Army was ranked 19th in the world and was smaller than the army of Romania. Only three divisions in the US Army were considered combat ready and these lacked the modern equipment—especially tanks—that was the key ingredient of the German Army’s (the Wehrmacht’s) success. The Army Air Corps (the United States Air Force did not become a separate service until 1947, after World War II) was struggling to train pilots on mostly obsolete aircraft. Only the United States Navy was truly a force to be reckoned with and now the Japanese had delivered a devastating blow to the American fleet. Hitler watched as Japan conducted its Pacific blitzkrieg. The Japanese seemed poised to knock the US out of the war. Hitler expected America to cower and beg the Japanese for terms, just as the British and French had done at Munich. He waited a few days after the Japanese attack, searching for an opportune time to maximize the propaganda effect and announce his support for Imperial Japan. Then, on December 11, 1941, four days after the Japanese attack on Pearl Harbor, Hitler gave a speech at the Reichstag and, to the surprise of his generals, declared war on the United States. When Hitler’s Generals heard their Führer declare war on the United States their jaws dropped. Japan had not informed Germany of its plan to attack Pearl Harbor. Hitler had not consulted the Wehrmacht high command that Germany would take on the Americans. The German Army was fully committed to the titanic struggle in Russia. It was true that the United States had inadequate military forces and was unprepared for war, but it seemed unnecessary to add another enemy to an ever-increasing list of enemies. Germany was not bound by the Axis Tripartite Pact to declare war on the United States. Nevertheless, victory for the Axis was in the air. Hitler’s forces were expected to take Moscow in the spring. Japan had just smashed the American Navy. Hitler was sure that the “decadent bourgeois Americans” could not fight. On December 11, 1941, the Führer’s foresight still seemed infallible and America’s ability to fight a global war against the Axis powers of Imperial Japan and Nazi Germany looked impossible. Impossible, however, was not a word in the American dictionary and America rose to the challenge. Almost immediately after the Pearl Harbor attack, Americans shook of isolationism, rolled up their sleeves, and decided on courage. They decided to lead. It took tremendous effort, organizational skills, and sacrifice by a united America to raise the Army, Army Air Forces, Navy, Marines and Coast Guardsmen required to turn the tide against this vicious totalitarian onslaught, but that is what they were determined to do. Remember Pearl Harbor was their rallying cry. 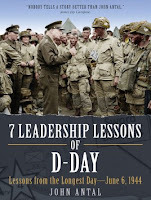 One thousand, two hundred and seventy-seven days later, on June 6, 1944, the Allies under the leadership of General Dwight D. Eisenhower, landed on the beached of Normandy, France, in the greatest amphibious operation ever attempted. The Allies cracked open Hitler’s Fortress Europe and started the march toward Germany. D-Day was a vital step in the destruction and surrender of Nazi Germany, and it started at Pearl Harbor, on December 7, 1941. For the ancient Greeks, the name Prometheus means “foresight.” Adolf Hitler’s hubris and lack of foresight on December 11, 1941, when he declared war on the United States, was, thankfully, one of biggest strategic blunders of WWII. John Antal is a Soldier, historian, author, leadership expert and master storyteller . 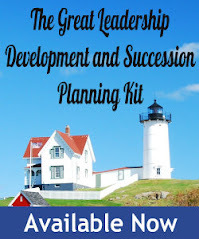 He has published thirteen books and hundreds of magazine articles on his historical and leadership subjects. 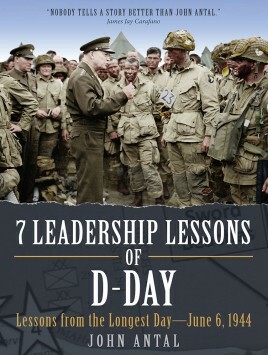 His latest book, 7 Leadership Lessons of D-Day: Lessons from the Longest Day, June 6, 1944, was published in October 2017 and is available at You can learn more about John Antal and his books at www.American-Leadership.com.